"We now have 28 more days to cool off as required by state law, which at any time thereafter we can file a 10-day notice to go on strike." In less than a month Chicago Public Schools teachers could strike for the third time in four years. 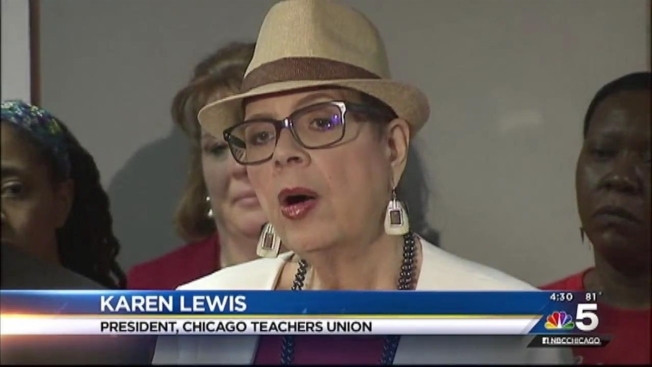 "Our membership has already voted to authorize a strike," CTU President Karen Lewis said at a Monday morning press conference. "We now have 28 more days to cool off as required by state law, which at any time thereafter we can file a 10-day notice to go on strike." On Saturday, the CTU rejected an independent fact-finder’s report that recommended teachers accept the school district's latest offer. In the rejection, Lewis said a countdown clock is ticking and they could walk off the job as early as May 16, which would disrupt the final weeks of the school year. CPS CEO Forrest Claypool has urged the teachers to reconsider and says he plans for the bargaining efforts to continue. "CTU is a union that likes to loudly proclaim that they're the most democratic union in the country and yet their elected representatives have never had a chance to vote on an agreement that their own leaders agreed to," Claypool said over the weekend. The CTU said it will agree to a contact that meets a specific set of criteria, including creating enforceable class size limits, being "economically reasonable" in terms of teacher pay and benefits, a charter school moratorium, an end to school closings and consolidations and a pension levy. "CTU has bargained in good faith, CPS has not," Lewis said Monday. "The board ... continues to threaten our pension and enforce the 7 percent pay cut, and just recently failed to pay contractual benefits to our paraprofessionals which saves them $850,000. CPS is searching for cash under rocks, in seat cushions and in their uncle's pants pockets." The contract proposal gives teachers a roughly three percent salary increase over four years, but requires them to kick in more for their pensions and health insurance. "We dedicate our lives to this incredible profession," Lewis said. "We cannot accept a situation when our standard of living is lower by the end of multi-year contract than at the beginning." In less than a month Chicago Public Schools teachers could strike for the second time in four years. The Chicago Teachers Union plan to reveal details of an impending strike during an 11 a.m. press conference at Chicago’s Merchandise Mart Monday. On Saturday, CTU rejected an independent fact-finder’s report that recommended teachers accept the school district's latest offer. In the rejection, union officials said a countdown clock is ticking and they could walk off the job as early as May 16, which would disrupt the final weeks of the school year.